Unfortunately I’m still in Tillamook. We had a pleasant ride along Oregon’s coast and we saw many sweeping views of the Pacific and the coastline. Much of the day we spent cycling on the flat roads around a large bay, through the towns of Bay City, Tillamook, Oceanside, and Netarts. There were several steep climbs, but my rapidly improving technique allows me to better tackle those hills. I restrain my urge to get over the hill quickly. I pedal slowly and methodically breathe. I have to remember that I am in this for the long haul. Sprinting up hills won’t do. Brian has been having chronic troubles with his rear tire tube. He busts one every thirty miles or so. 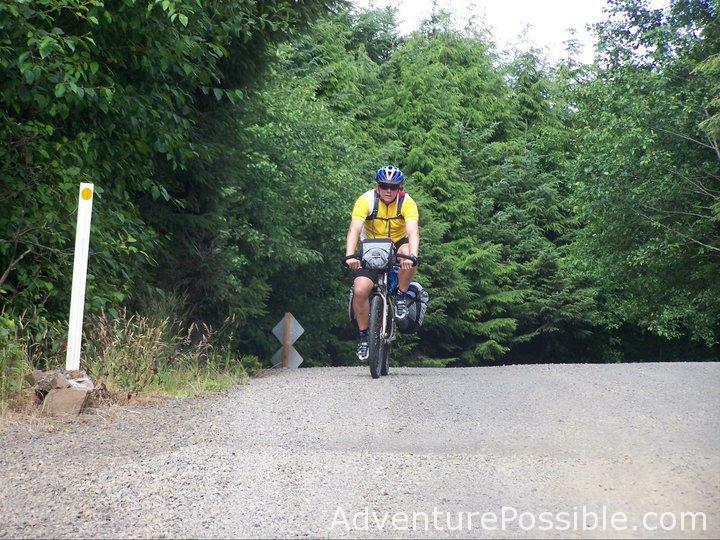 In Tillamook, he bought a thorn resistant tube to better handle the rocky roads. Hopefully it will be the solution to his problems. We had to stop twice today to replace his rear tube. The replacement requires the panniers and the wheel itself to be removed. Getting the new tube back on is a bear, and tomorrow morning we have to wake up early to put yet another tube and tire on because we could not do so on the roadside where he broke down. The beefier tube and tire won’t stretch easily, so it will take strength and time when we aren’t so fatigued. The most critical event of the day I have saved for last. We biked about forty miles today, but we are only twenty miles from where we started. Somewhere by Cape Lookout, I led us astray. We turned left instead of right, and the wrong road delivered us to Tillamook around seven o’clock this evening. We had had lunch in Tillamook six hours earlier, just before we went to the bike shop for Brian. I recognized the bridge to Tillamook almost immediately when I saw it and my heart sank. It was such a demoralizing, disheartening sight. Down but not defeated, Brian and I regrouped and came up with our newest game plan. We decided we would camp at a local private campground and treat ourselves to Pizza Hut to lift our spirits. The Pizza Hut pizza was great. I can’t yet polish off a whole pie yet, but it won’t be long now until I am eating eight slices and asking for ice cream. After dinner, Brian and I rode through town to an RV campsite we had seen earlier. No sign indicated they allowed tenting, but I was sure we could work something out with the campground host. Sure enough, the host was nice and accommodating and the rates are super cheap for a private campground, five dollars each for a patch of grass to pitch our tents and access to a bathroom with a coin-operated shower. I’m certainly pleased with how this arrangement turned out because other campgrounds that we called wanted close to fifteen dollars for each of us. I’m rambling and incoherent. My ribs hurt from lying on my stomach and writing. Perhaps tomorrow we will have our first day in which everything goes right. I’m sure that’s what I’ll dream about tonight.